An estimated 13% of the United States land mass is underlain by coal deposits, an immense energy resource. Not all the coal is mineable but much of it contains natural gas. One way that un-mineable coal resources have been exploited in the past is through the extraction of coal bed methane (CBM). Its simple chemical nature (it is composed primarily of methane) makes it cleaner burning than coal generating up to 50% less carbon dioxide per unit energy. Originally, CBM was thought to have formed millions of years ago when the coal itself was being formed. However, recent scientific discoveries suggest that much of the gas was generated by indigenous anaerobic microbial systems within the coal seams long after the initial process of coalification. This type of natural gas, referred to as biogenic natural gas, relies on the active biological conversion of coal into methane by a complex consortium of microorganisms. Biogenic natural gas has also been shown to be produced in other types of unconventional gas deposits including tight sands and gas shales. Interest in biogenic natural gas has grown significantly in recent years with the realization of its vast potential and the significant benefits that this energy source has over traditional fossil fuels. Above, students in the Department of Civil & Architectural Engineering are developing new technologies for enhancing the production of biogenic natural gas, UW photo. 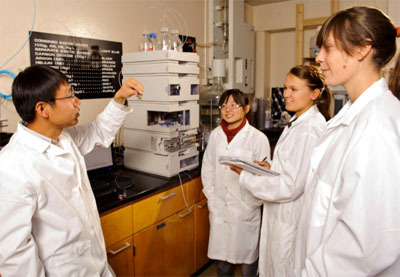 Professor Urynowicz is the Director for the Center for Biogenic Natural Gas Research, one of the Centers of Excellence related to important energy research programs at the University of Wyoming sponsored by the School Energy Resources (http://www.uwyo.edu/ser/research/centers-of-excellence/). The Center for Biogenic Natural Gas Research is focused on commercializing technologies that enhance the production of renewable, clean-burning biogenic natural gas. In the Department of Civil & Architectural Engineering, students in Professor Michael Urynowicz's laboratory are developing new technologies for enhancing the production of biogenic natural gas from coal and other hydrocarbon reservoirs. "The realization that many of the world's fossil fuel reserves contain methane that is biogenic in origin promises to transform the way we view and manage these energy resources. Through the development of technologies that enhance the production of biogenic natural gas we now have the opportunity to extend the lifetime of these energy resources indefinitely," says Urynowicz. In places like Wyoming's Powder River Basin this could mean putting CBM related resources and infrastructure back into long-term economic production." "There are several approaches for enhancing the production of biogenic natural gas in coal seams," Urynowicz explains. "The more conventional approach is to use nutrient amendments to stimulate microbial activity within the coal seams. At the Center for Biogenic Natural Gas Research we have focused primarily on physicochemical and enzymatic treatments that depolymerize/solubilize a fraction of the coal, making it more bioavailable. Another approach for stimulating the production of biogenic natural gas that shows great promise is the addition of a supplemental source of carbon such as biomass." Researchers at the Center recently filed a patent to protect a technology referred to as Cellulosic Coal Bed Natural Gas (CBNG). The approach uses locally grown perennial forage crops, such as Alfalfa, Switch grass or Miscanthus to supply monomers (simple sugars) as a food source for the methane-producing microorganisms within the coal seam. These simple sugars can be delivered to the coal seam where they can be transformed into natural gas by the indigenous microorganisms and recovered using the existing CBM infrastructure. Unlike cellulosic ethanol and other biofuel processes, which require capital-intensive production plants that are limited by the size of the fermentation reactor, the Cellulosic CBNG process utilizes vast coal seams and the indigenous microorganisms within to transform these simple sugars into natural gas. Because the Cellulosic CBNG process uses biomass instead of coal as the carbon source the biogenic natural gas produced by the process is carbon neutral. The technology has the potential to create a new energy paradigm by changing the way we look at fossil fuels" says Professor Michael Urynowicz. This technology and others currently being developed at the Center promise to support and add value to Wyoming's abundant coal and biomass resources by keeping them viable in the energy economy of the future.